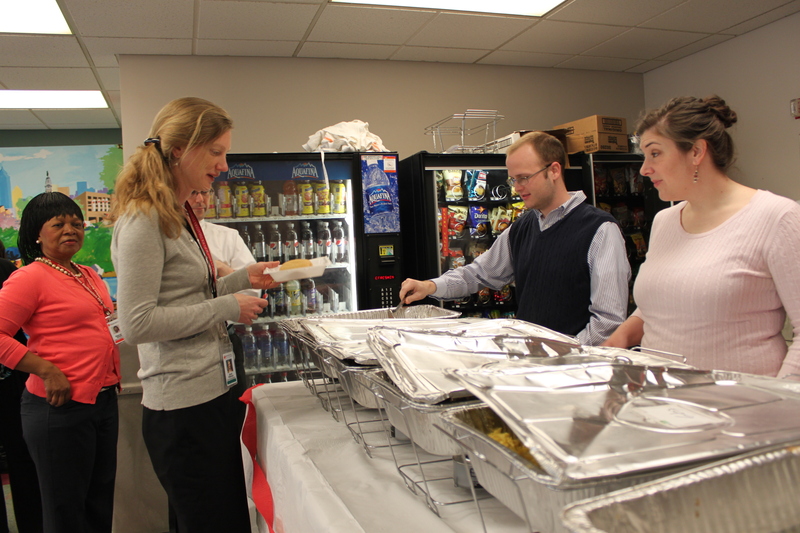 Several Red Cross employees had the opportunity to explain the fulfillment that comes from doing “our kind of work” to several children who visited the office of the SEPA chapter for national “Take your Child to Work Day.” Upon arrival, they were greeted by Fred Cross and fed a delicious, “office kitchen” cooked breakfast of eggs, French toast and bacon. Our CEO, Judge Hughes came in toward the end of the meal and gave an enthusiastic welcome to all participants. Next on the agenda was a tour around the building with Kevin Wilkins and Dianne Fingar. 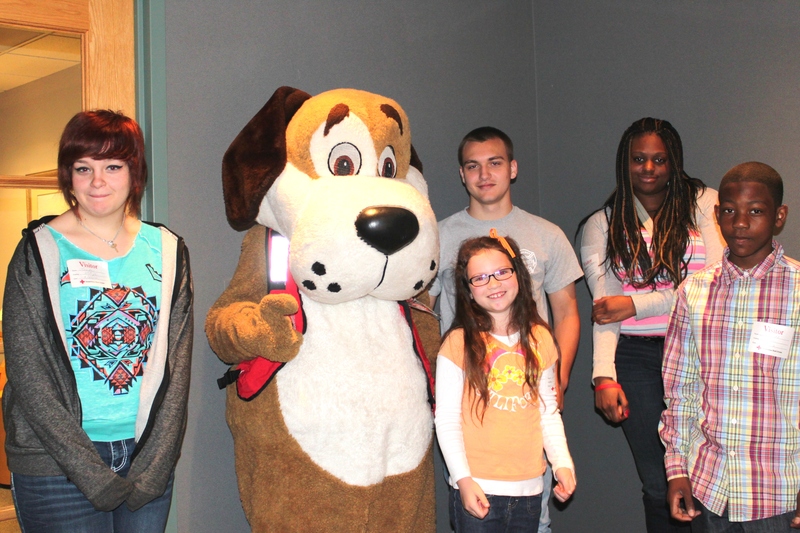 After a quick visit to Judge Hughes’s office, the kids toured The Bridge and learned about disaster response. The red phone, our direct line to the Philadelphia Fire Department was an object of fascination and served to emphasize the importance of our role in responding to fire disasters in our community. Next, the kids examined the detailed (and extremely fascinating) maps of the region on the wall next to The Bridge and learned which areas are subject to floods during heavy rain. After a short tour of the lunchroom, they received official Red Cross volunteer vests, worn by responders in emergencies. Dianne explained the purpose of Red Cross house and how the SEPA Red Cross is proud to provide a shelter for fire victims who do not have another place to stay. Eventually, we found our way down to the vehicle well and the young people inspected a few emergency vehicles and heard which ones respond in different disaster situations. Terry Johnson proved an excellent guide and fervent promoter of the emergency responder role. He was proud of the ERV fleet and it’s capacity to provide essentials to those who have lost everything. We learned that the Red Cross has 30,000 cots for disaster response in our region. Amazing! 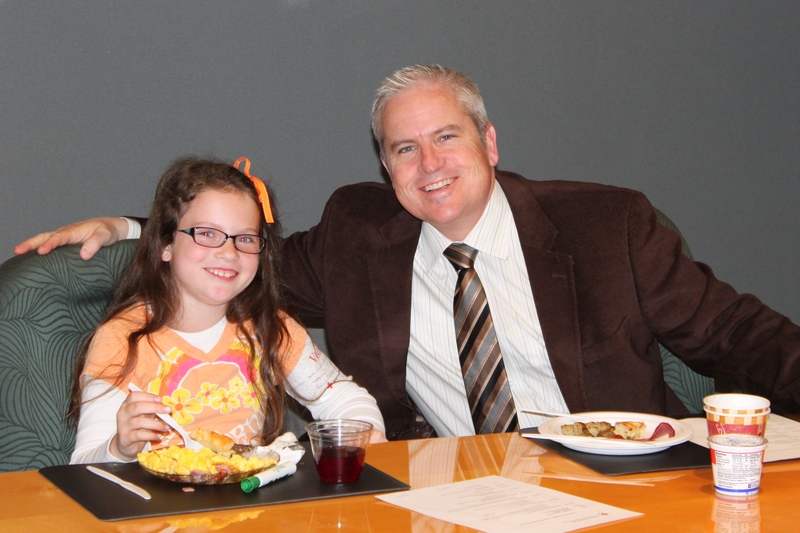 Later, the kids joked and laughed at a pizza lunch with Judge Hughes. She quizzed our visitors about favorite sports teams and was shocked to discover that allegiance to our home town teams was not as strong as she assumed. One brave twelve year old, Ricardo, stood firm in his loyalty to The Raiders despite her teasing. Sixteen year old, Lawrence, talked about his experience as a volunteer fire fighter, and Linda, 14, showed everyone a picture of her bass guitar, which is shaped like a daisy. Everyone agreed it was very cool. One of the most moving scenes of the day was watching the kids learn how to provide citizen CPR, basic first aid. 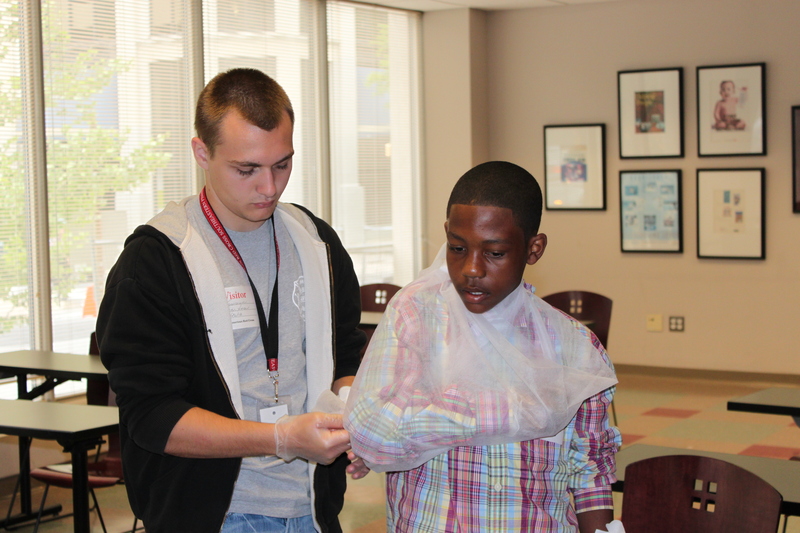 They tried very hard to get it right as they practiced creating a basic sling and bandaging one another. It was a reminder of how everyone, young and old, appreciates learning how to be useful in a time of need. Heads Up Loyal Red Cross Event Aficionados! There is a fantastic event that demands your presence! Several hundred people will step up and step out on April 21, 2012 – this Saturday — for the American Red Cross Southeastern Pennsylvania (SEPA) Chapter’s 10th Annual Red Cross Walk and Run to Save Lives. The Walk and Run helps to raise funds for Red Cross House and local families left homeless by a fire, flood, or other disaster. The 5K Walk and Run will begin in front of Memorial Hall in Fairmount Park and wind through the scenic park, taking walkers past the Japanese Tea Garden and the Horticulture Center. Individuals, businesses, organizations, groups are very welcome! More importantly, the event is dog friendly, so participants are welcome to bring their dogs. There’s even a special dog tent with giveaways for the dozens of pooches that take part. Registration begins at 7 a.m., warm-up at 8 a.m., and the Walk/Run starts at 8:30 a.m. Participants should register in advance online at http://www.redcrosswalkandrun.org. The web site features a “My Walk/Run Site,” Here, participants can set up a personalized page to support the Red Cross, find a group to join and learn more about each registered team. Donations to the Walk and Run are accepted until April 30th. Proceeds from the Walk and Run benefit local disaster relief and Red Cross House, SEPA Chapter’s one-of-a-kind short term residence for disaster victims. 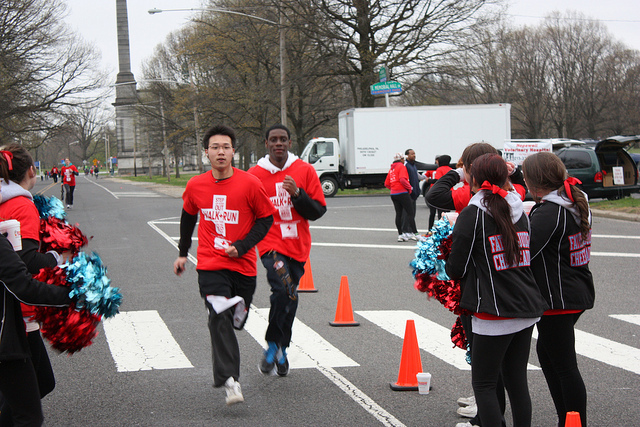 For more information, call 215-405-8888 or visit www.redcrosswalkandrun.org. What is the Red Cross doing for the victims? This question is asked at disaster sites worldwide. Just stop and think about that for a minute. Worldwide. And consider, a Red Cross volunteer representative must be there to provide an answer. This is essential because when we hear of a disaster we think – what can I do? We experience the human impulse to help others in need. When we learn what the Red Cross is doing to help the victims, we feel comforted. The Red Cross is our proxy when we cannot be there ourselves. But how do we receive this information? The volunteers at the scene are often too busy meeting the extraordinary needs of victims to speak with those whose job is to share information with the general public. That’s why, in addition to traditional volunteers, the Red Cross needs exceptional people who are willing to communicate with the media and answer that question – What is the Red Cross doing for the victims? The mission of Disaster Communications is to ensure that vital relief and recovery information is shared in a timely and accurate manner with both internal and external audiences on a disaster relief operation. Why is this so important? The public needs to know what is being done so citizens can help the Red Cross by volunteering themselves or sending donations to support our work. Here’s the tricky part. Disasters happen in the middle of the night. People who do public affairs and communication in the middle of the night require special skills. In a state of shock, concern and interrupted sleep, they must maintain a professional demeanor, be articulate, answer questions with complete knowledge of the facts and convey confidence in Red Cross activities. These volunteers play other vital roles like protecting victims from media intrusion, or brokering interviews with victims or volunteers when appropriate. Discretion is the key. For anyone interested in acquiring experience in public relations, being an on-call 6pm to 6am public affairs volunteer for the Red Cross is a fantastic opportunity to gain diplomacy skills, get to know local media persons, and develop communication expertise while providing a crucial service. We are always looking for new faces to add to our on-call team. Please consider giving it a try. Encourage a friend. Think, the next time you hear the words, “The Red Cross is on the scene providing food and shelter to the those whose homes where destroyed.” That’s what the Red Cross is doing for the victims. What are you doing for the Red Cross? Perhaps you were unaware, but here at the Red Cross of Southeastern Pennsylvania, we are looking forward to the Red Cross Walk and Run to Save Lives on Saturday, April 21! This is an annual fundraiser that invites members of our community to walk slowly, walk faster, run fast, run slowly, sprint, run with a dog, walk with a dog, walk with assistance, roll, push a stroller or boogie across our 5K finish line! Don’t be shy! Try wearing tiny red running shorts – or anything red, for that matter and show your solidarity. Many enterprising individuals form fundraising teams, which is how I ended up invited to a fantastic breakfast. 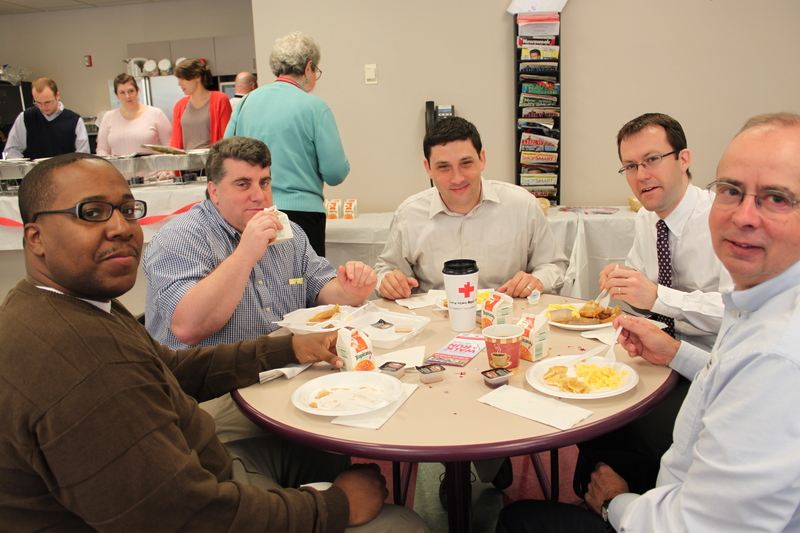 Team “ES Faster than Disaster,” held a breakfast fundraiser this morning at chapter headquarters. The menu included pancakes, scrambled eggs, and turkey and beef sausages. There was even a French toast line for my more patient colleagues. For a mere fiver, I got all the pancakes, eggs and turkey sausages I could consume in a single sitting! The best part is that it goes straight to (my hips) disaster relief! Other teams are initiating their own methods of money extraction. 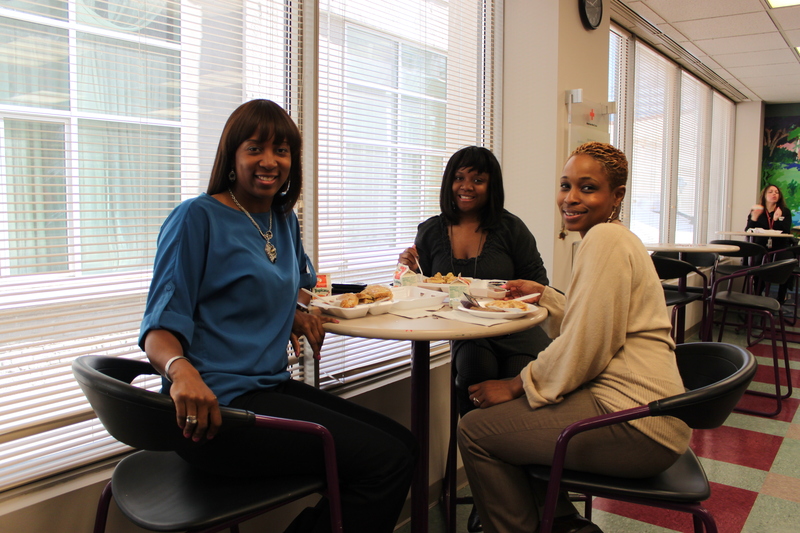 Apparently, our Volunteer Administration Department has morphed into the Fast and Fabulous team. They are sponsoring a General Store and Vintage Photo Booth. Hard working Red Cross team members can have their photos taken wearing the Red Cross paraphernalia of yesteryear. A recently received email invites us to shop the General Store for everything from Bonsai plants to hipster dresses. Who could refuse? Not to be outdone, our Financial Development team is providing a singing telegram service. I’ve heard some of those folks can really croon. The Red Cross invites you to be creative in your own workplace. Organize some office bonding for a great cause and then invite everyone to come out on April 21st and propel their bodies in any way they please at the Red Cross Walk and Run to Save Lives. It’s important to mention that being part of a team is not required. If you are your “own dog” like my teenager, sign up as an individual and come join the fun. Even if you’re just hearing about it now there’s still time to sign up! Check out this page for more information. Working for the Red Cross you get used to a lot of uncertainty. A lot of Plan Bs and Plan Cs. A lot of schedule rearranging. It’s the nature of working for an organization that responds to disasters. But Monday (April 9th) was easily unprecedented, not only for me and my 2 ½ year Red Cross career as Director of Communications, but also for the organization overall. It all started with a phone call I didn’t hear. The call from our chapter’s Chief Operating Officer at about 5 a.m. to say there was a massive 5-alarm warehouse fire in the Kensington section of Philadelphia. Trust me, not hearing a call like that is not a good way to start your day. We were caring for about 25 people displaced from their homes because of the fire. I was with those residents when word came that two firefighters died. It deepened the sadness everyone was already feeling. At the fire scene, I recorded and posted to social media a message of condolence to the fire department and the firefighters families from our CEO. Our hearts go out to them. It’s painful. The Red Cross and fire departments have a special relationship. We rely on each other. After they save people, we feed them, we house, them, we clothe them. I went into the office to tend to a few other things, including preparing for a visit from our national CEO the next day. But I was called out to the scene again to manage some media interviews. While there, our Director of Recovery and Red Cross House and I met with the families whose homes were destroyed by the fire. They were distraught. They were scared. But our volunteers made them feel better and reassured them they wouldn’t have to go through this alone. I had been awake for only a few hours, but I felt like I had been up all day. But as it turned out, my day was only beginning. While in Kensington I got word that there were two big apartment complex fires to which the Red Cross was responding. One in Bucks County and one in Montgomery County. I headed to Montgomery County. A fire had ripped through a building at Abrams Run apartments. About a dozen families, 23 people were displaced, including Ahmet, a little boy I met who was wrapped in a Red Cross blanket to help keep him warm. I spent some time at Abrams Run before heading home, thinking my day was over. I only had a few moments to pick up my kids and drop off my stuff before going to my weekly basketball game. But while playing basketball, I got another call that the Red Cross was opening a shelter in Chester County for more than 150 firefighters battling a wildfire in Berks County. The Red Cross was supplying the cots, blankets, food, and some volunteers. It was an hour drive, but off I went, keeping in my mind that I still hadn’t showered from this morning. I didn’t have a dry shirt. I was wearing shorts on a cold night. I didn’t have my camera or even a pencil. But the Red Cross way is to figure something out. So I met up with a colleague half way to the shelter to get a Red Cross shirt. I borrowed an iPhone from one of our volunteers at the shelter so I could take pictures and video. We sweet-talked someone into giving us the Wifi password and access to a computer. But while there, I was overwhelmed with pride as our volunteers methodically and quickly unloaded and set up dozens and dozens of cots. They arranged to make the place as homey as possible. The firefighters were gracious and grateful. But it’s us who should be grateful. Setting up those cots was the least we could do. Earlier that day two firefighters died protecting us. The 150 plus firefighters I was with at the shelter were risking their lives protecting us. So I had to curb any notion I had to complain about how tired I was or how much I wanted a shower. I spent several hours at the shelter shooting videos and pictures and uploading to twitter and facebook, getting the word out about what the Red Cross is doing, all the while marveling at the bravery of the firefighters and the compassion of our volunteers. I’m happy to say all the firefighters made it back alive. No one was killed and the wildfire is out. In one day, in one 24 hour span, with the help of 40+ volunteers the Red Cross of Southeastern Pennsylvania responded to 13 disasters, at least one in each of our five counties. The disasters included a wildfire, two apartment complex fires, a 5-alarm warehouse fire, a brush fire, and eight house fires. We helped 256 people. We provided lodging at a motel or at Red Cross House for 123 people. It was one disaster shy of our one day record of 14. But I can proudly say each and every person we helped got the same high quality of care, care that without the Red Cross, they would not have gotten. I hope you are as proud as I am of the work that was achieved. We are after all, your local Red Cross. Since we are primarily volunteers, it’s your neighbors, your friends, and your co-workers that make up our workforce. We are funded solely by your generosity. So when we succeed, you succeed. So thank you. It is because of you that we were able to respond to 13 disasters in 24 hours. Some American Red Cross volunteers understand disaster in their bones. They experience one personally. Lily Wilson Potter and her daughter Olive Potter Earnshaw boarded lifeboat number seven, off the side of the Titanic at 12:45 am on April 15th in order to survive the most famous maritime disaster on record. Lily Potter (widow of wealthy Philadelphian, Thomas Potter Jr.) and Olive Potter Earnshaw, were passengers on the Titanic, returning from a trip to Europe that began in January, 1912. Lily Potter sought rest and distraction for her daughter after Olive’s difficult decision to divorce her first husband, Boulton Earnshaw. They were among 2,224 passengers who boarded the Titanic at its European ports. Four days into the crossing, the ship hit an iceberg and sank in freezing water with over a thousand passengers still aboard. Lily Potter and Olive were among the 760 passengers rescued from lifeboats by the HMS Carpathia. Lily Potter knew about disaster relief. Her husband, Thomas Potter Jr. was called up to serve as a member of the National Guard in the aftermath of the floods at Johnstown, Pennsylvania in 1887. Moved by the plight of the survivors, Lily Potter sent a trained nurse from her own household to assist Clara Barton in the aftermath. Her husband received a medal for his service. Lily Potter said of the Titantic, “It was the most tragic sight anyone will ever witness.” The fate of the scores of people on deck as the ship went down stayed with her. In 1916, during the First World War, she began volunteering her time with the Southeastern Pennsylvania chapter of the American Red Cross. Lily was the driving force behind the Production Department, marshaling thousands of volunteers to both collect and manufacture essential materials for overseas hospitals. In a 1945 written history overseen by Mrs. Potter, it states that the Production Department included “the old and young, the rich and poor of all races and creeds and color – all who wish to find an outlet for their natural desires to be of service in time of war or of disaster.” Clearly, Lily Potter’s embrace of all who could be of service speaks well of her as a citizen of our diverse nation. 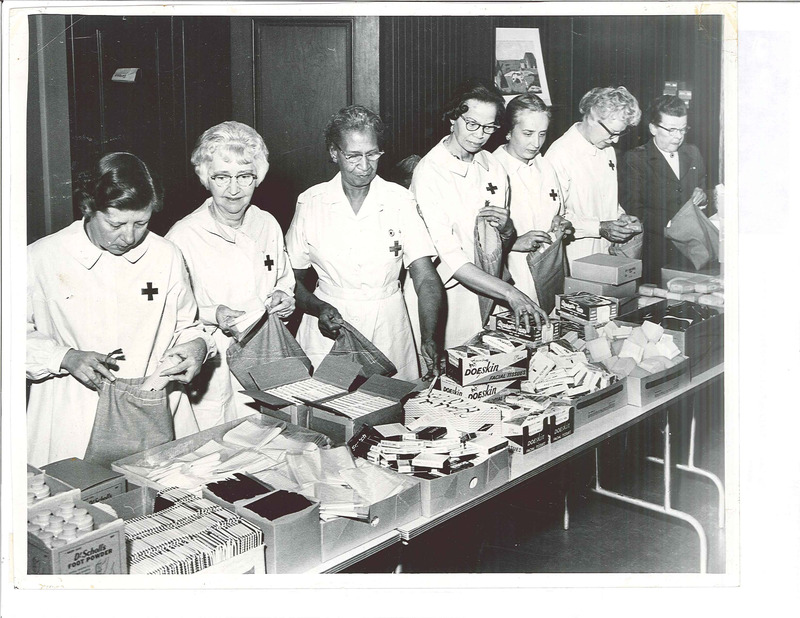 In 1944, at the age of 88, Lily was recognized for 27 years of dedicated service to the American Red Cross. 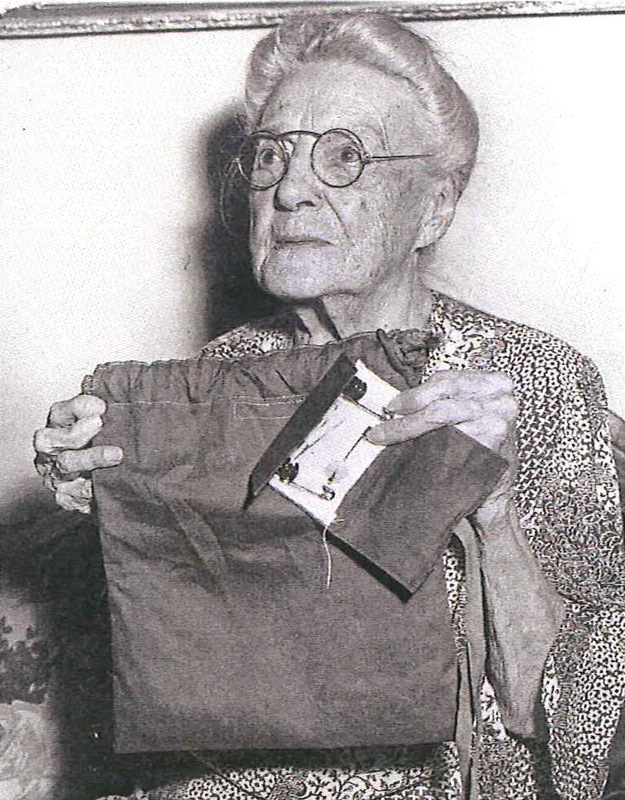 Her daughter Olive also remained a lifelong American Red Cross volunteer leading the “cut garment” distribution department through both World Wars. Lily Potter and her daughter Olive knew firsthand what it was like to be cold, shocked and bereft survivors of a terrible tragedy. Their commitment to the American Red Cross was a fitting tribute to their extraordinary experience.